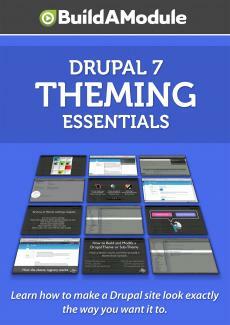 In this chapter, we've covered a lot of ground in regards to theming in Drupal. We started off by looking at the role of theming and how it overlaps and differs from designing and coding in Drupal. And then we did an overview of all of the different ways you can adjust output in Drupal; some of them through configuration, some of them through code and some of them through CSS. From there we looked at how you decide what the best way is to adjust the output when there is multiple options available to you. For example, we looked at why you might want to make modifications in code rather than in configuration and introduced you to the features module which allows you to wrap up configuration changes and version control code so you can use those in the same way you would normally use code modifications. We looked at the difference between a theme function in a template file and talked about reasons why you might want to use one over the other. And then we looked at the theme registry, which is an essential component of the theming layer and which often causes issues if you don't understand how it works when you're making modifications to a theme. Next we took a look at how to use the theme developer module in order to identify where any piece of output comes from on your page. And then we looked view modes which allow us to create reusable sets of structures that can be used to display a node in a particular context or across multiple contexts. We looked at field formatters and their role and we'll look at those more in future videos. And then we looked at coding standards. And how the coding standards that apply to coding modules apply to the theming layer.